Classic American styling sets the mood in room 6 at the Birch Ridge Inn. The bed is king sized, but this time the headboard is bronzed metal work in the style of antique beds found on the prairie. Complimenting the bed are marble topped side tables with art deco styled lamps. A massive Armoire chest dominates one side of the American Classic room and serves as your closet. A matching bureau is tucked away in an alcove. 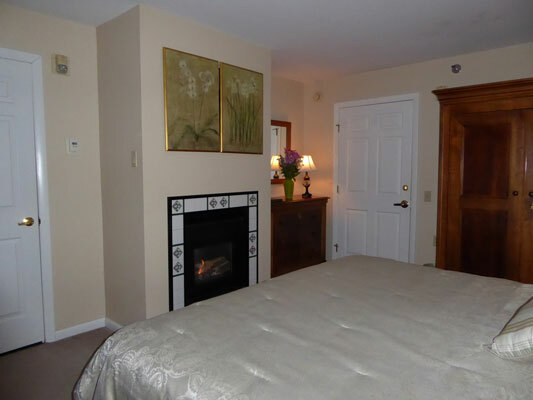 At the foot of the bed, there is a gas fireplace with a ceramic tile surround to warm your soul while you relax. Contemporary panels hang over the fireplace and hide the HD television when not in use. Like room 5, room 6 also has bay windows which overlook the Covered Carriageway and Mary's gardens. In the bay window, you will find two comfortable chairs that are perfect to sit in while reading a good book. Of course, the room is also equipped with complimentary WiFi internet access and an alarm clock with usb charging port. 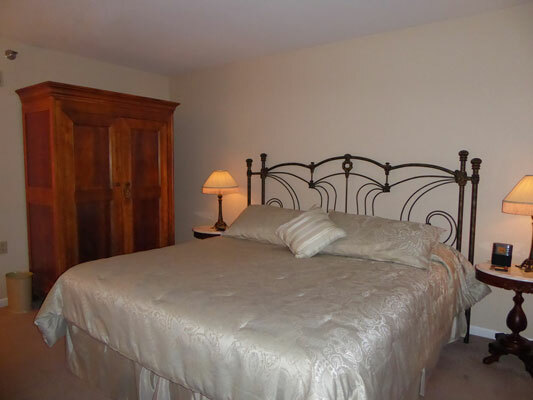 Room 6 also features a large private bathroom with a tub and shower. Room 6 is configured to comply completely as a lodging room under the Americans with Disabilities Act. Use our Room Rate Calculator to help you plan your vacation in the American Classic Room at the Birch Ridge Inn.